One of the last things Jesus did before he died was give us His mother Mary to be our mother. From the Gospel of John, “‘Woman, behold your son.’ Then he said to the disciple, ‘Behold, your mother.’ And from that hour the disciple took her into his home” (19:26-27). Jesus’ final words not only pertained to Mary and John, they also included me and you and allof humanity. “Jesus Christ, after having given us all he could give, that is to say, the merit of His toils, His sufferings, and bitter death; after having given us His adorable body and blood to be food for our souls, willed also to give us the most precious thing He had left, which was His holy mother,” said St. John Marie Vianney. Yes, Jesus gave us Mary to be our mother! But how do we cultivate a relationship with our mother Mary? What can we do to take her into our homes, like St. John did? If praying an entire Rosary seems overwhelming to you, start small. Consider praying one decade of the Rosary each day for five days. Reflect upon one mystery each day as well. By the end of the week, you will have prayed an entire Rosary! You can break it down even more by simply praying one Hail Mary at the beginning of each day, asking Mary to pray for you and your special intentions. This can be especially effective when including other members of the family. Every morning on the way to school, my children and I say morning prayers, offering our day to the Lord. We include one Hail Mary and one Memorare, asking the Blessed Mother to be with us and to pray for us. 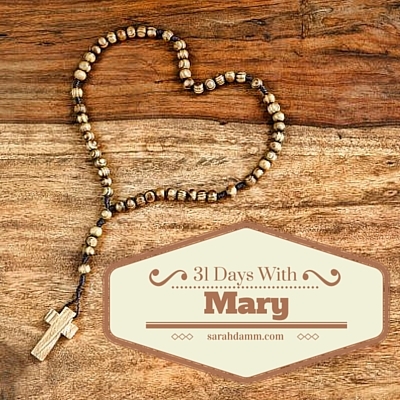 This is a doable way for us to invite Mary into our day. There are many beautiful Marian prayers you can incorporate into your personal and family prayer times. A quick Internet search will give you many good ideas. And if you want to work on adding the Rosary into your prayer life, a beautiful and encouraging book on praying the Rosary is The Rosary: Keeping Company With Jesus and Mary by Karen Edmisten. There are many, many good books about the Blessed Mother. Some are tried and true, like True Devotion to Mary by St. Louis de Montford. Others are more contemporary, but just as reverent, like 33 Days to Morning Glory by Fr. Michael Gaitley, Under the Mantle by Fr. Donald Calloway, or Walking with Mary: A Biblical Journey From Nazareth to the Cross by Dr. Edward Sri. It is so helpful to read what the Catholic Church truly teaches about the Blessed Mother. Often, Mary is a mysterious part of our faith. So, not only will reading about the Blessed Mother help you get to know her better, but through your reading, you also will be able to share the truth about Mary with others. Many saints had incredible devotion to Our Blessed Mother, including St. Maximilian Kolbe, St. Pope John Paul II, Blessed Mother Teresa, and more. So it is beneficial to read personal accounts of Our Blessed Mother’s influence in the lives of the saints and other faithful Catholics, as inspiration for our own relationship with her. And if we want our children to know Mary from an early age, it is good to find some children’s books about her to read as a family. My family especially likes Take It To the Queen: A Tale of Hope by Josephine Nobisso. If you don’t have one already, find a beautiful statue or picture of the Blessed Mother to display in your home. Growing up, I kept a statue of Mary, given to me by my grandmother, in my bedroom. This statue, even though it has seen better days, still sits on my desk today. 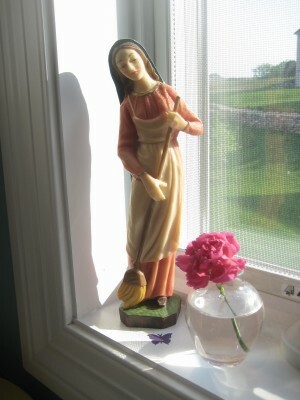 I also have one of Mary with a broom in hand, titled The Kitchen Madonna, sitting on the window sill in my kitchen. Glancing at her throughout the day helps me get through the mundane tasks of homemaker and mother. And one of my favorite pictures in our home is one that an artist friend gave us as a wedding gift. Titled Magnificat, it is of Mary, smiling so joyfully and holding up her infant Son Jesus. During May (the month of Mary) and October (the month of the Rosary), set up an extra-special space in your home to honor Our Lady. 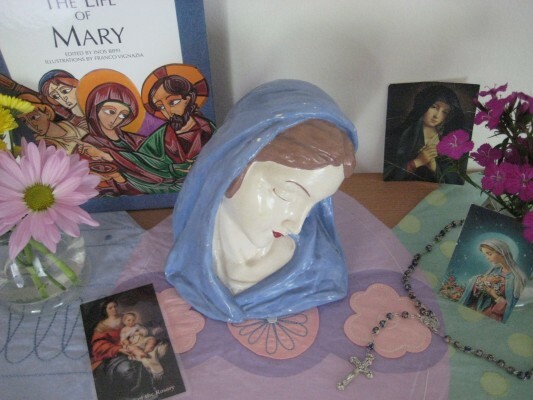 A Mary altar doesn’t have to be fancy. It can be simple but beautiful atop a fireplace mantle or bookshelf. If you don’t have a statue of Mary, a framed holy card and Rosary can adorn your altar. Get your kids involved by asking them to make little bouquets of flowers for the Blessed Mother. They will love doing this! Light a candle, and take time to pray (alone and with your family) in front of your altar throughout these two special months. The Catholic Church is very good about teaching us about the importance of fasting andfeasting. We have so many days of celebration in the Church! Find a few family favorites, including some Marian feast days, and celebrate! Again, it doesn’t have to be fancy. It’s amazing how wonderful and fun white hot chocolate on the Feast of the Immaculate Conception or Mexican food on the Feast of Our Lady of Guadalupe can be! 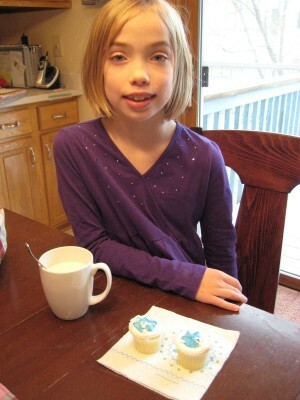 Oh, and don’t forget cupcakes with blue frosting for Our Blessed Mother’s birthday! 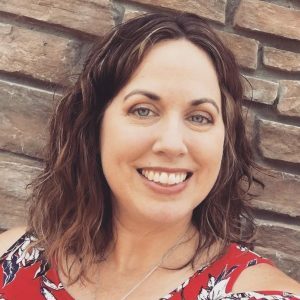 A book that I reference for Marian feast day ideas is Mondays With Mary by Meredith Henning, and the blog Catholic Cuisine has some great recipes for Marian feasts as well as other feast days and liturgical seasons. 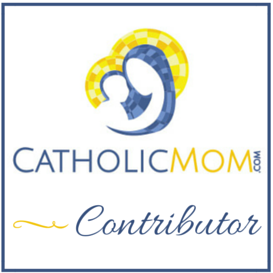 Originally posted on May 13, 2014, on CatholicMom.com.